Requirements: Windows 7 or later. 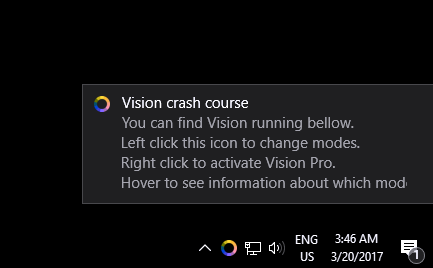 Windows Vista and Windows XP are not supported. 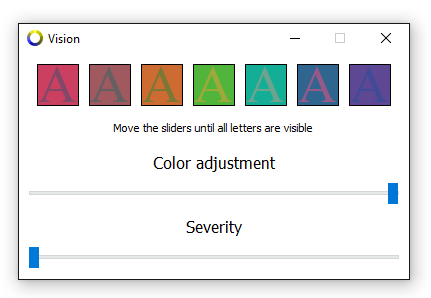 Vision is software allowing people with different kinds of color blindness (color vision deficiency) to see more colors. Vision provides solutions to some of the everyday problems experienced by color blind people. 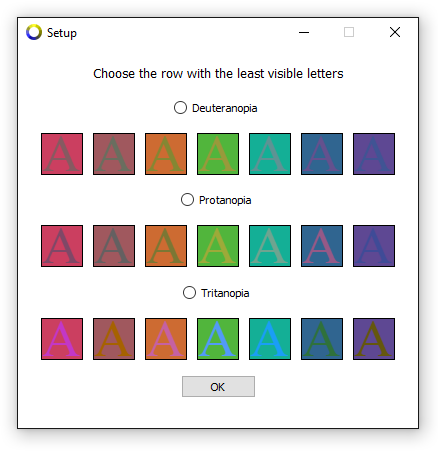 People with various types of color deficiency could benefit from the use of Vision software including those affected by Tritanopia (blue color vision deficiency), Deuteranopia (green), Protanopia (red). People generally have the assumption that if you suffer from blue-yellow color blindness these are the only colors you have trouble seeing. But that’s wrong. Color blindness doesn’t relate to just two color shades you can’t distinguish, it is the whole color spectrum which is affected. There are close to 300 million people who are colorblind and struggle every day. Many of them are prohibited from becoming pilots, scientists, doctors, police officers, firefighters, electricians, etc. It is these people that Vision is aiming to assist, by making the world a much more colorful and better place for them.